Note : Your request will be directed to KRYTAR. The 152610 from Krytar is a directional coupler that operates from 0.5 to 26.5 GHz. It has a coupling value of 10 dB with 1 dB variation over the band. The coupler has a directivity of over 13 dB and an insertion loss of less than 1.5 dB. It can handle up to 20 watts of power and has a VSWR of 1.45:1. 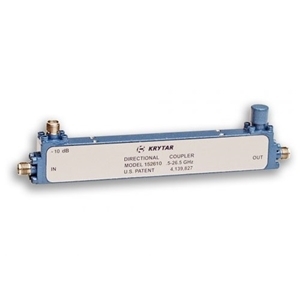 The coupler is available in a module that measures 4.40 (L) x 0.38 (W) x 0.73 (H) inches with 2.4mm connectors and is ideal for electronic warfare (EW), commercial wireless, SATCOM, radar, antenna beam forming, and EMC testing environments. The directional coupler can also be manufactured to meet rigid military specifications.